What are the benefits of going to a smaller, regional city instead of a capital city like London or Dublin to improve your English level? The English Course Madrid explores the benefits of going off the beaten track to improve fluency. I’ve been working as an English language teacher since 2009. Throughout this period many students have asked me to recommend a city or town where they could go for a couple of months to improve their English level, as well as numerous students telling me about their experience of going abroad to learn English. There are countless positives, but the point that stands out, simply because I’ve heard and been witness to it so many times, is negative: students who go to a capital city like London or Dublin find it hard to integrate with the local English-speaking population and, as a result, start hanging out with people of their own nationality, thus greatly reducing their interaction with the English language. If you are considering going abroad for a month or so to improve your English level, you are probably preparing for a B2 or C1 level exam. If you are preparing for a B2 level exam, your goal should be to improve your fluency, by which I mean: becoming comfortable talking in the past, present and future, using modal verbs to show probability, possibility, and to give advice, being able to converse about everyday topics using relevant vocabulary and being able to talk about your life, your interests and your plans for today, tomorrow and the foreseeable future. If you are between levels B1 and B2, and if you communicate solely in English for two months, you should reach the level of B2, which is the most important level to reach when learning a foreign language. If you are between levels B2 and C1, you should aim to improve your fluency with an emphasis on learning collocations and idiomatic language. Practise phrases that are repeatedly used among fluent English speakers and concentrate on developing your listening ability so that you can comprehend ‘rapid colloquial speech’, however speak at a clear, natural speed. Don’t aim to speak as fast as native speakers. The best way to guarantee communicating solely in English is to travel alone and stay with a host family, preferably with a family that has experience in accommodating language students. English academies offer all-inclusive packages of accommodation and schooling, which can be pricey, but are the most direct route to improving fluency. In Waterford, Ireland, for example, a twenty-hour-a-week, four-week course including host-family accommodation and meals costs around two-thousand Euros. I’m choosing Waterford as the example because I’m from Waterford and I know it’s a good city for students of English to study in. Waterford is a city in the south-east of Ireland with a population of just over fifty thousand. The city centre is compact which makes it easy and pleasant to get around on foot. 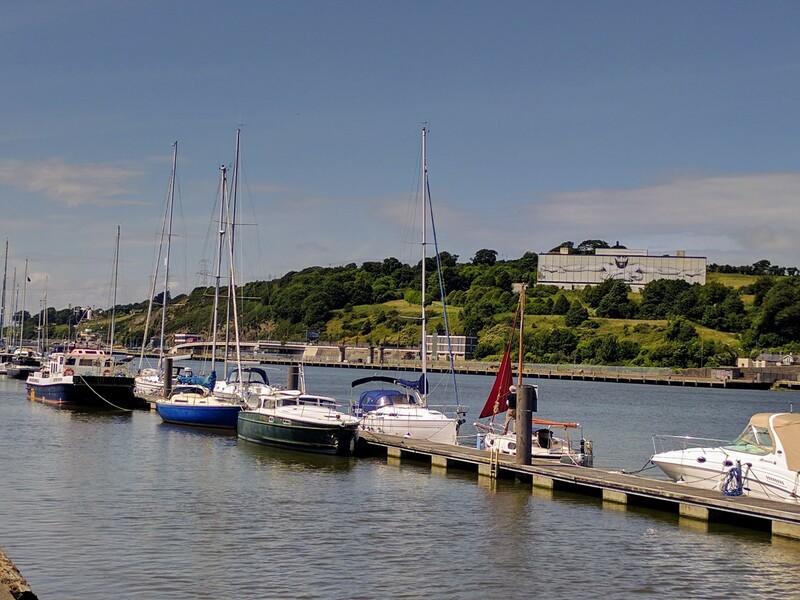 Starting from the River Suir, which flows alongside the quays in the northern part of the city, it’s possible to walk around the centre within thirty minutes. John Robert’s Square, the main square of the city, has outdoor cafes, the Book Centre—a fantastic bookshop over three-and-a-half floors stocked by employees who know their books and, if you are part of the swarm who seem to be manically addicted to Gran Via’s Primark, you won’t suffer withdrawal symptoms as Primark’s original store called Penneys was first opened in Ireland and there is one in Waterford. In addition to the shops, Waterford’s streets showcase their history. The city was founded by the Vikings in 914 making it the oldest city in Ireland. At the eastern end of the River Suir, the recently revamped Viking Triangle recounts this heritage. The Triangle includes Reginald’s Tower—a round tower dating from the 13th century, a Viking longboat, which is very popular to take a selfie in if that’s your style, and the Medieval Museum. In the centre of the Viking Triangle is the Bishop’s Palace—a grand Georgian residence which hosts a tour of affluent, 18th-century living. Across from the Palace is the world renowned, House of Waterford Crystal where you can observe Waterford Crystal’s intricate, glass-making craftsmanship in action. Fittingly, the Bishop’s Palace houses the oldest piece of Waterford Crystal along with, oddly enough, a lock of Napoleon’s hair. While walking around, drop into the Munster Bar, a great pub for a pint or the Waterford-loved, ‘bottle of Guinness off the shelf’. The Munster Bar looks onto 33 The Mall, noteworthy because the Irish tricolour was flown there for the first time in 1848. The green, white and orange flag represents the Gaelic traditions, the supporters of William of Orange, and the white centre-strip symbolises a lasting peace between the two communities. If you are between the levels of B1 and B2, I’ve described an ideal but realistic way to reach the level to pass a B2 exam. If you are between the levels of B2 and C1, a little bit more input and practice would be necessary to be prepared for a C1 exam. I’ve used my hometown of Waterford as a good, regional city to improve fluency, but, of course, there are many small cities and towns one could choose. My advice is to get first-hand recommendations. Research the location and academy when choosing this type of learning experience so you don’t return home feeling like you didn’t learn enough for the money you spent. Having lived the past nine months in the centre of Madrid, two weeks ago I returned to Ireland for the summer. Ireland has been experiencing a heatwave, temperatures not dissimilar to a Madrid spring (unfortunately at the moment of publishing the weather has taken a turn). I’ve been spending some of my free time cycling to places I used to go to in my childhood. Returning home from living in a very urban setting, the beauty of the Waterford countryside is striking. Here are some photos I took during the June 2018 heatwave.